Welcome to the world of tomorrow. A place where cats and dogs not only live together, they’re happy to do so. Where dead singers can be brought back as holograms and that apparently doesn’t offend anyone. Where people carry magical devices that contain all the world’s information, yet spend most of their time simulating combat between birds and pigs. Where we talk about 10 possible inventions of the future we can’t wait to see. Time travel past the jump to see the list. The Dictator is the latest from fearless comedian Sacha Baron Cohen. Another raunchy romp from Cohen, The Dictator, unfortunately, lacks the spark that made his past films Borat and Bruno so damn funny. 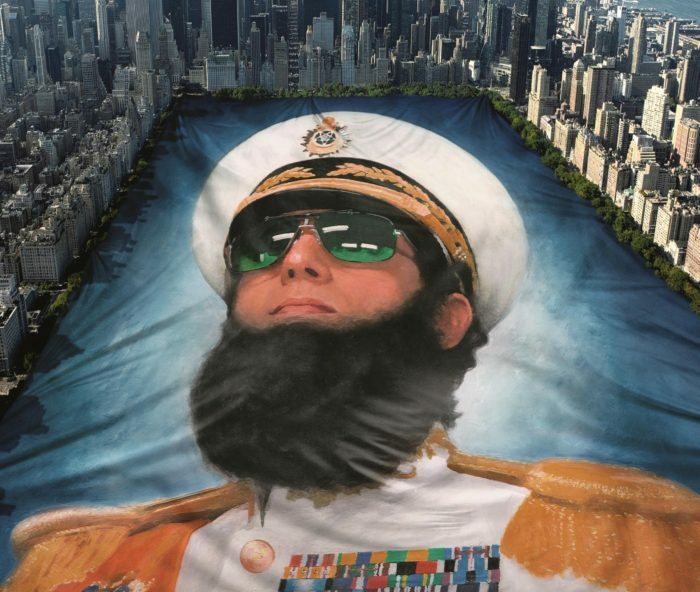 The Dictator is Cohen’s first starring non-mockumentary. He is re-teamed with director Larry Charles and joined by a cast including; Ben Kingsley, Anna Faris, and John C. Reilly. I went in with mild expectations and left with a mild reaction. Admiral General Aladeen (Cohen) is the tyrannous dictator of the fictional Northern African nation of Wadiya. Aladeen essentially has the power to do whatever he wants, including paying American celebrities like Megan Fox, Oprah Winfrey, and Arnold Schwarzenegger to sleep with him. That aside, all Aladeen wants is a meaningful relationship. Tamir (Ben Kingsley) is Aladeen’s uncle who tires of his ruthless nephew’s incompetence. So Tamir conspires to overthrow Aladeen by replacing him with a double on a visit to New York City. Once this happens Tamir can have the fake Aladeen sign a contract at the U.N. ultimately ending Aladeen’s reign. This leads to Aladeen becoming lost in America and soon finding work alongside a vegan activist Zoey (Anna Faris) in a natural produce store. What follows is a mixed bag of filthy one-liners and gross-out sight gags. I say “mixed bag” because some of the jokes are fine and some are just bad, like Love Guru bad. The one recurring joke that stings the most is Aladeen always trying to come up with a new American name. He gets these names by looking at signs like “Men’s Washroom” or “Maximum Occupancy”. All he does is put different inflections and accents on these words as if that’s how comedy works. The name he goes by for most of the film is “Allison Burgers” which I’ll admit is kind of funny, but they should have left it at that. The initial announcement that The Dictator was not going to be a mockumentary was definitely a disappointment. I mean, Cohen’s improvised un-p.c. humor is more or less what made him famous. The comedic tension and awkwardness of his past films are what made them so great. The Dictator feels too safe and not nearly as shocking. Cohen’s new character General Aladeen is essentially a less oblivious Borat. Borat was funny because he had virtually no grasp of Western Culture. His skewed interpretation of modern America is what made that film so funny. Aladeen is dumb, but he’s far more rude than dumb. It’s Aladeen’s arrogance that’s primarily used as the basis of the jokes. Doctor: Do you want the Aladeen news or the Aladeen news? That’s the kind of comedic wordplay you’d see in something like Airplane. Most of the other jokes utilize either some form of sexism or racism or both. The Dictator also has a handful of sight gags that vary. My favorite is where The Dictator sneaks into a funeral service to steal a beard from the corpse of a man he believes to be Morgan Freeman. So, it’s worth a laugh or two, maybe a rent. I just hope Cohen can catch fire with his next character. I’d hate to see Cohen hit a Mike Myers-like slump this early in his career. It would of been easy to go with the soundtrack to Saturday Night Fever in remembrance of Bee Gee Robin Gibb. Instead I decided to go with the Bee Gees more affectionate and sweeping album Bee Gees’ 1st (though technically their third release). I often get the feeling that many people are unaware that the Bee Gees were already a notable Brit Pop band before their rise to Disco prominence. Perhaps better known in their native Britain, the Bee Gees in their early days were primarily known for their psychedelic brand of folk and tender pop ballads. Highlights on this album include such early Bee Gees’ classics as; “Holiday”, “To Love Somebody”, and “New York Mining Disaster 1941”. Though it’s always been clear that Barry Gibb was the driving force of the Bee Gees, I’ve always felt that in the early years Robin was the most engaging vocalist of the group. Robin Gibb’s tender and very English delivery was always pitch perfect for the group’s ballads. “Holiday” is his crowning achievement on this album, finding an impeccable balance between beautiful and bittersweet. Of course all three of the Brothers Gibb are consummate vocalists resulting in some of the best harmonies you’d be likely to find in pop, or any genre for that matter. Though that wouldn’t mean anything if wasn’t for the fine songwriting credited to Barry and Robin (though I’ll assume that’s mostly Barry). I’m gonna go on record and say that “To Love Somebody” is the best pre-1977 Bee Gees’ track. “To Love Somebody” might even be my favorite Bee Gees song period. It’s a lushly produced, catchy, pop ballad that could stand toe-to-toe with the best of any other British Invasion band of the time. Aside from the three most popular tracks I’ve already mentioned the rest of the album is just as enjoyable. The Bee Gees really excelled in the psychedelic pop department. 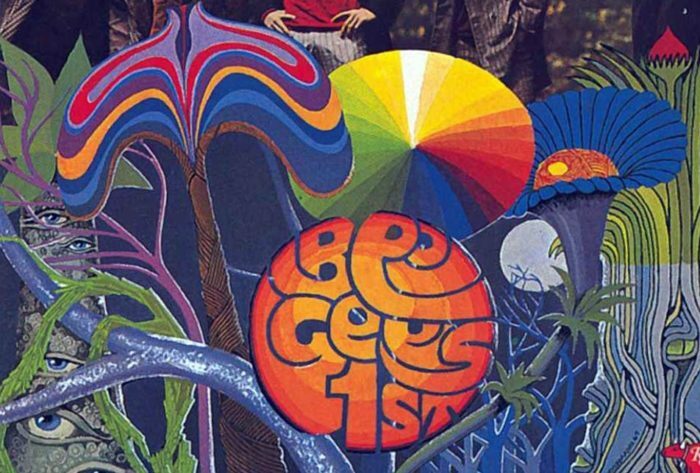 It’s actually puzzling it took them as long as it did to become big in the U.S. Bee Gees’ 1st is an album I’d recommend to both fans of 60s pop and 70s Disco fans. 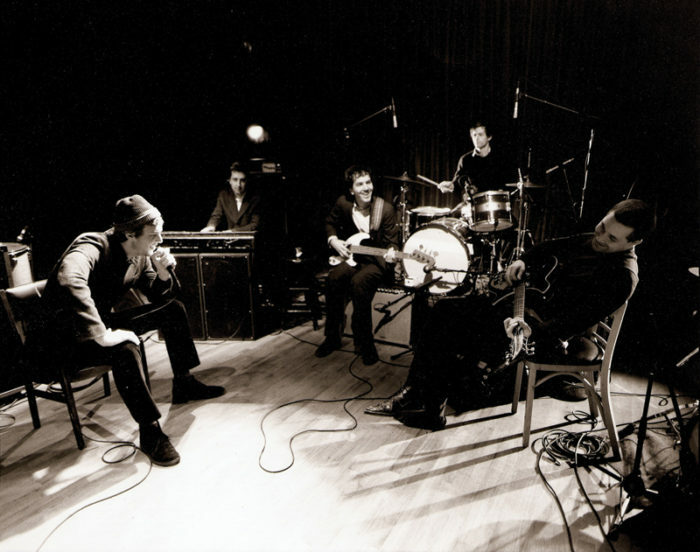 The albums gives some intriguing insight into a band that was probably better than most people gave them credit for. R.I.P Robin Gibb. So, Battleship. Who knew that for all these years what we were actually play was a Michael Bay-esque battle for the planet between brave sailors and devious robot aliens? Nobody, because that’s not how the game works. And yet, here we are. This week, we tackle the issue of dumb adaptations with a bunch of projects that are theoretically in the pipeline, but really, never should be made. You can turn the card over and look at the answers after the break. Syndicate is the latest in a long line of quality first person shooters that will be forgotten for not being a big enough deal like Rage and Bulletstorm before. Which is a shame, because Syndicate has quit the pedigree: it is both the revival of a classic, somewhat forgotten franchise and one of the best coop FPS games in a while. If you haven’t been keeping score, the first Syndicate was an isometric RTS that came out for the PC in 1993. So the leap to this new game is a big one. What remains of the original series is its setting: a gritty cyberpunk future where the world is run by corporations. Miles Kilo is an agent of Eurocorp who has been given the company’s sweetest new digital implants, designed by scientist Lily Drawl (Rosario Dawson). Eurocorp’s CEO, played by Brian Cox, sends Kilo on some corporate espionage missions, which all quickly turn into bloodbaths. The cinematics in Syndicate are generally pretty cool, the game does a great job of making Rosario Dawson and Brian Cox look like they do in real life, which is surprisingly uncommon in games. But the game basically comes down to heavily scripted corridor shooting, something that has to be done absolutely amazingly to be exciting in this day and age. This game doesn’t get there, and the campaign isn’t particularly long either. To borrow the title of this blog, it was mildly pleasing. What did seem great was the online multiplayer. You get to level up, choose gear, upgrade things and all the other stuff that seems necessary to the online shooting experience nowadays. Players can even start their own corporations and hire people, a neat way to bring clans into the game. It all boils down to objective-based cooperative missions, which deliver on the promise of games like Resistance 2 and Brink. Teamwork is paramount, as players can follow the roles typically associated with MMOs in combat. I was all about healing and hacking my team, it helped me get into it faster than many multiplayer FPS games. Oh yeah, hacking. So implants aren’t just glorified Google Goggles, providing a neat HUD. They actually let you hack into computers in the environment, and even in other people’s brains. So you can, for example, reprogram somebody to make him turn on his allies, then commit suicide when they’re all dead. It’s pretty brutal. Perhaps what’s most brutal is when Kilo finds someone with a useful chip in their brain, when he will proceed to use a special tool to yank it out of their head. Indeed, this game earns its M rating. So I had a good time with Syndicate. The singleplayer wasn’t much, but it certainly wasn’t bad. The multiplayer is real cool, I wish more people were into it. It’s so integral to the experience, EA doesn’t even require an online pass to play. But Syndicate’s already been out for a few months and it seems that everyone has already forgotten about it. I wouldn’t be surprised if in a few more months, the servers are quiet. Such a shame.